TripsGeo Scratch-Off World Map is Your Very Own Window on the World! 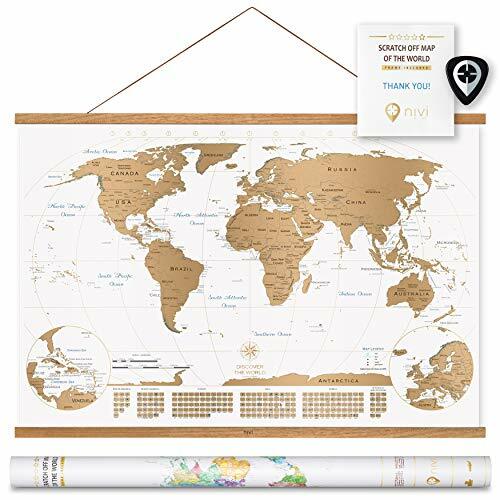 Look back on your past journeys and dream of new travel adventures with this elegant black and gold, foil coated map of the world poster with flags. International World Map has complete accuracy with clearly outlined countries, territories, islands, landmarks, tourist attractions, national flags, and ocean reliefs. Scratch off your travels as you go with our included precise scratching key while revealing a beautiful, vibrant and colorful map with intricate geographical detail underneath. Did you leave scrapings behind on the poster? No worries - just use the included soft black cloth to wipe away for a clean surface. Use the 3M stickers to provide more details of your travels. When done, just place all your accessories in the convenient black bag, roll up the poster and store it back in the tube for safe keeping. Beautiful World Map with Flags (17 inches X 24 inches) Elegant Storage Tube Precise Scratcher Black Storage Accessory Bag Weight: 8 ounces Makes an Ideal Gift for Any Avid Traveler or Anyone With Dreams to See the World Over! 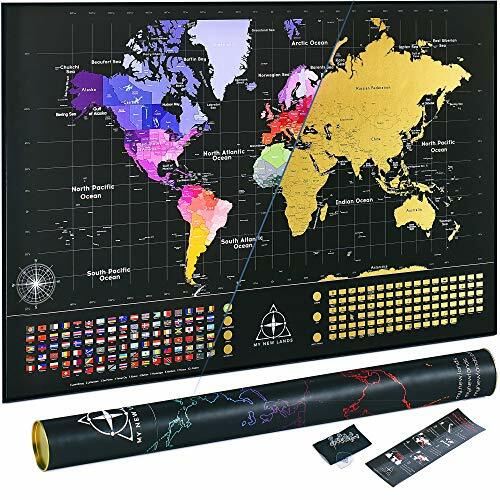  THE WORLD OVER: This Scratch Off World Map Poster allows you to track and show off your journeys and international travels around the globe. Beautiful, highly-detailed cartography map features premium quality, easy to scratch foil on thick deluxe glossy paper, measuring 17" x 24".  BEST OF BOTH WORLDS: Neutral black and gold poster looks great hung anywhere in your home or office. Easily scratch the foil to reveal vivid, vibrant colors for each destination you visit. Simply use the included scratcher, and scratch away at each country you've traveled to and its colorful flag.  A PERFECT WORLD: Enjoy the map's intricate geographical details like US state outlines, Canadian provinces, country borders, islands, landmarks, tourist attractions, country flags, and oceans. Each large poster comes with a precise scratcher, black wiping cloth, a nice black bag to hold all the accessories, and an elegant storage tube to store your poster when not in use.  WORLD-CLASS GIFT: This map makes the ideal gift for any avid traveler! The map is beautifully packaged in an easy to open tube. No wrapping required! Let them show the world all the countries he or she has experienced. Or, give to your partner or spouse as a memento to share and look back on your vacation memories together, and dream of all the new adventures you'd like to experience one day.  PROMISE THE WORLD: We don't just make promises, we keep them. TripsGeo is a trusted manufacturer, and we stand behind the quality of our products. Our customers mean the world to us, so if you are not completely satisfied with your purchase, just let us know, and we'll provide a full refund. 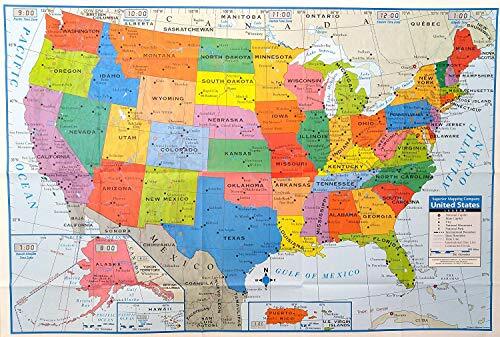 From the trusted folds at Superior Mapping Company this large poster size United States Map is perfect for the home or office. Map features Capitol and major cities. INNOVATIVEMAP gives you the best Scratch off World Map. Comparing to the other maps, our all-inclusive package with 1 World Map + 1 US Map + Full Accessories Set offers you the perfect gift for any occasion. Take advantage of the special price before the sale ends! Designed by hand with incredible passion for traveling - Each single details, state or country is perfectly defined and easy to find. The clear borders and vibrant colors transform this scratch off world poster in the perfect wall art for your office or room! Complete Bundle- What's inside the deluxe tube? 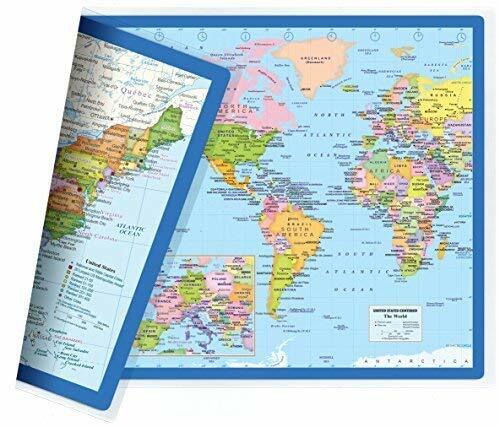 o1 Scratch off World Map - US Standard Format: (17 x 24") - Easy to find a frame for it! oMagnifying Strip - see it closer, remember it better! Guaranteed-If you are looking for high quality Scratch off Maps at an affordable price, please try our INNOVATIVEMAP. We guarantee your 100% satisfaction! If you are not satisfied, please contact us. then we'll replace it for free or refund your money! No questions asked! No hassle! Enjoy your travels & Be Happy! Add the scratch off map to cart and start your amazing adventure! JOIN US & SEE THE WORLD IN A NEW WAY - Are you a traveler? Does someone you know love traveling? 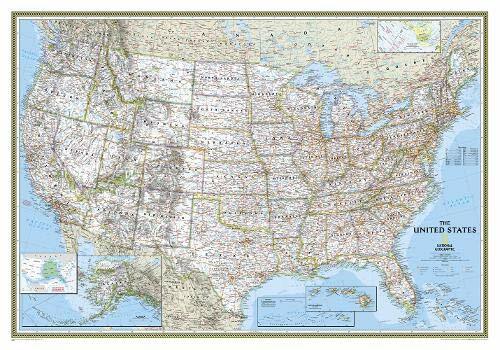 We are travelers and we designed this Large Scratch Off Map (17 x 24") for people like you. All capitals, states or countries were drawn by hand with unstoppable passion for a creative & free world. This Black & Gold Scratchable Map will not only allow to you to track your travels but also share your experiences with your friends. - Travel, Scratch & REMEMBER FOREVER!  UNIQUE GIFT FOR THE LOVED ONES OR YOU - Everyone loves receiving awesome gifts and a scratch off map set is the perfect one. You can use it to elegantly decorate your room, office or even the pilot cabin! It's never been easier to share your travel experiences with those around you and create engaging conversations. It even fits on the side of your backpack while traveling around the Europe! - Take Action, Push your Limits & Enjoy the Experience! BE SURE YOU GET THE BEST QUALITY - We chose the highest quality glossy laminated paper to offer a product that will last AT LEAST until you travel all 195 countries! A thin foil protects the colors during scraping which gives you a nice & clear image of each place you've visited. NO map will ever arrive damaged considering our deluxe tube which protects your wall art 100% of the time. - We don't cut corners!  WORRY FREE & PROTECT YOUR INVESTMENT: 100% Satisfaction or Money-Back Guarantee. INNOVATIVEMAP is renowned for World Class customer service and thousands of happy customers. Because we trust the quality of our products, if something ever happens with your Premium Scratch Off World Map, WE WILL CHANGE IT or REFUND IT immediately without any costs from your side. It s a whole new spin on learning about geography! 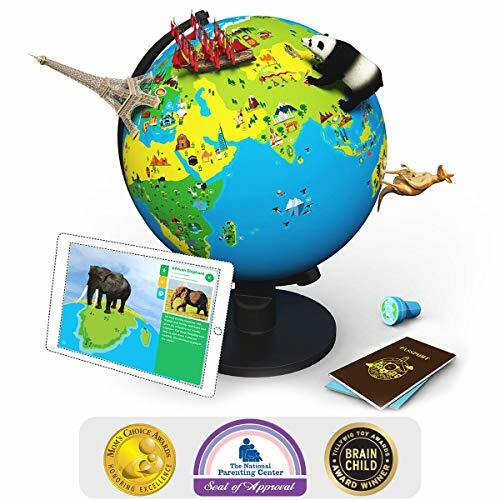 The Puzzle Globe is designed to help even PreK learners investigate the continents, the oceans, famous landmarks, different kinds of animals, and so much more. The big chunky pieces are designed to match up to holes on the globe, so it s easier for children to put continents in place. 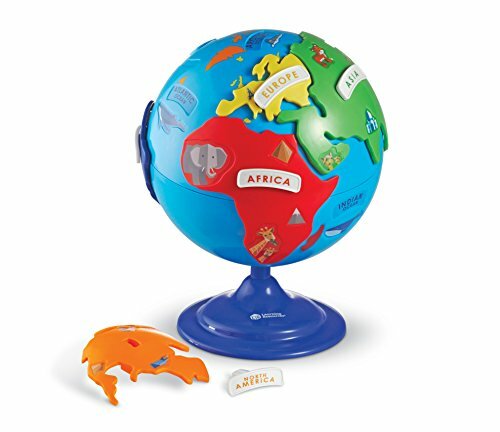 Includes a tough and durable base (with oceans labeled), rotatable globe, 6 continent puzzle pieces, 6 plastic continent labels, and blank label stickers. Globe measures 8 in diameter; largest piece (Asia) measures 5 L. For ages 3 and up. Discover the inner explorer in you with this 3-in-1 interactive illuminated globe for kids. 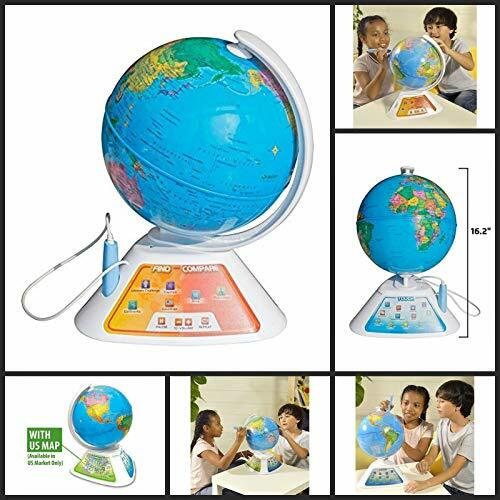 This light up globes of the world with stand also becomes an educational constellation globe, an excellent children's globe with clear easy to read cartography. Also makes a great day and night globe themes and cosmos! USA Toyz interactive world globe also comes with smart globe app which would help broaden their imagination through this interactive talking globe for kids, instead of limiting it. This 3-in-1 Earth globe, celestial globe and light up globe for kids STEM Toy will provide a beautiful printed brochure about the Earth and the illuminated constellation globe. This lighted world globe with stand comes with an illustrated constellation booklet and an App download info. 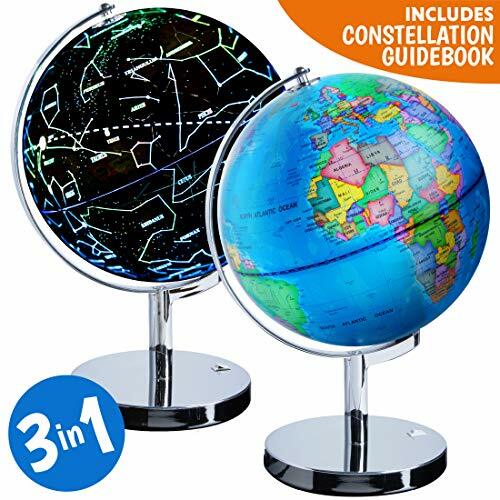 Explore and discover the world with light up the sky toddlers globe with constellations, a great earth globe for kids for exploring every detail on the map. Get inspired, educated discover and explore with this USA Toyz 3 in 1 Interactive Globe with Constellations, Light Up Smart Earth Globes of The World with Stand. 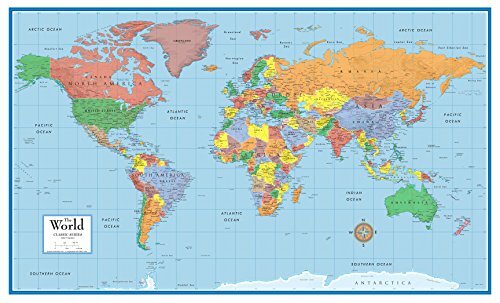 24x36 World Wall Map Classic Elite Series Poster: This elegant, richly colored classic-style World Elite Series map features the incredible cartographic detail that Swiftmaps.com has been known for. The World Classic Elite features a Miller Projection, which reduces distortion of land masses as they near the poles. Laminated on both sides for dry-erse markers and years of durability! Only the best from Swiftmaps.com line of quality wall maps!! THIS IS A 1 PACK PACKAGE OF US MAP/US Centered WORLD MAP. The item is: 1. Small poster size, 17.5 x 11.5 inches, convenient for use on table or desk, or to bring wherever you go. 2. Heavy Sealed Lamination-much heavier than the normal wall map lamination, makes it tough and durable. It's washable and writable with any kind of pen for different purposes. GET BOTH U.S. AND WORLD MAPS IN ONE AT THIS LOW PRICE. THIS UNIQUE PRODUCT WOULD BE A GREAT GIFT AT ANY TIME. If you would prefer our Europe centered world map, please check out our other variations. THIS MAP FEATURES A U.S. CENTERED WORLD MAP ON ONE SIDE AND A U.S. MAP ON THE OTHER. THE WORLD MAP IS A REVOLUTIONARY MAP THAT PUTS THE UNITED STATES IN THE CENTER. Why does this matter? The traditional world map misrepresents the relationship between the U.S. and the Asia-Pacific region by separating them to opposite sides of the map; our teachers can't even show the Japanese attack on Pearl Harbor during WWII on the traditional world map. Only on the U.S. centered world map can we easily see the shortest route from the U.S. to any place in the world. THE ASIA-PACIFIC REGION IS THE FASTEST GROWING AREA IN THE WORLD. It contains 60% of the world's population and 8 of the G20 countries, where the U.S. does 40% of its import and export business. This U.S. centered world map much more powerfully helps us to understand the importance of partnerships and challenges that the region offers to the U.S. THE WORLD MAP CONTAINS AN INSET OF EUROPE AT A LARGER SCALE, TO MAKE IT EASY TO READ. THE U.S. MAP FEATURES MORE THAN 350 LARGEST U.S. METROPOLITAN AREAS. Ranking by population of metropolitan areas rather than individual cities more meaningfully represents the relative size of the cities. The world map is the best world map for all Americans, especially our young generation, because it gives us a more balanced view of the world. THIS IS A GREAT GIFT FOR ALL AMERICANS, ANYTIME! 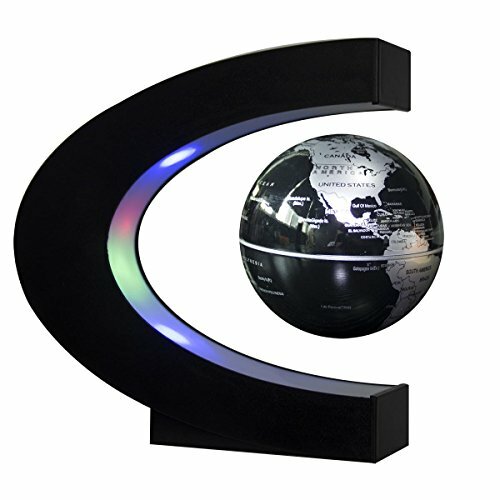 Illuminated World Globe for Kids with Stand Built-in LED Light Illuminates for Night View Colorful, Easy-Read Labels of Continents, Countries, Capitals & Natural Wonders, 8"
for the discerning parent or educator. This small globe is a great size for kids, and comes with a sturdy stand that sits perfectly balanced on any desk or shelf. Young children will love the bright colors, and will get bonus learning time by using it as a novel nightlight. It's sure to stay bright, with over 300 hours of illumination on a single set of batteries. Grab the gift that grows with your child, as it will come in handy for geography lessons as they get older. Eventually, it'll become a beautiful d cor piece for their dorm room. The most well educated nightlight money can buy! Specs & Details Dimensions: 10.2" x 8" x 8"
Enjoy the perfect educational accessory that grows as your child blossoms! (NO BORDERS OR NAMES ON GLOBE) Orboot is a one-of-its-kind 10" globe and Orboot is also an app. When you bring the two together, it opens up the magic of Augmented Reality. A no-boundaries globe lets kids of age 4+ explore the incredible world through the fun & interactive app. It engages them in a way that they can relate to every story, and ignite their imagination to make each adventure their own. Orboot has culminated from a wealth of research and representation to give an experience that will help the young minds grow. COMPATIBILITY - Orboot app is free on iOS and Android. Compatible with - iPad 3rd gen & above, iPad Air all models, iPad Pro all models, iPad mini 2 & above, iPhone 6 & above; Android 3GB RAM and above. THE BOX comes with a 10 globe, passport, stamp, country flag stickers, and a detailed help guide. CATEGORIES IN APP - cultures, monuments, inventions, animals, maps and weather for various countries across the globe. STEAM Ahead - A perfect toy for the ever-curious kids that sparks their imagination and curiosity. It helps build knowledge, linguistic and cognitive skills. Makes for an amazing and unique gift for kids! 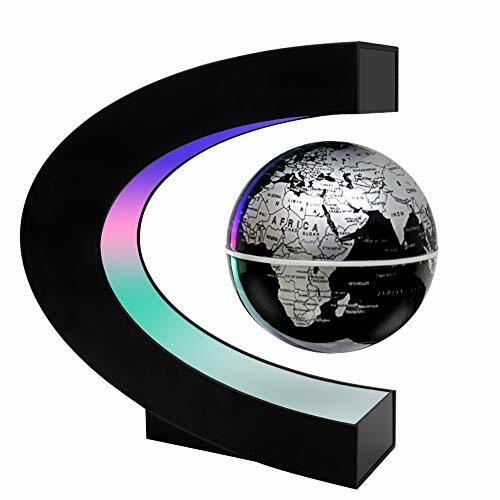 This globe is a good promotion gift as it is very cool for good desk decoration, This cool gadget makes a great display unit for your retail shop, business and home,which also is an awesome high tech gadget that people of all ages will enjoy. The Awesome Interactive World Map from Think Gizmos is a great learning aid that all the family can use. The World Map is great to look at and features over 1000 facts about 92 different countries. It also includes a variety of different usage modes. Once you feel you have learnt enough facts you can put the world map into quiz mode to test your knowledge. The facts you can learn about the Countries on the Interactive Map include Capital Cities, Flags, Language Spoken, Famous Landmarks, Population and random fun facts. The map can be used either on a floor or can be wall mounted so will look great in a bedroom, school or play room. 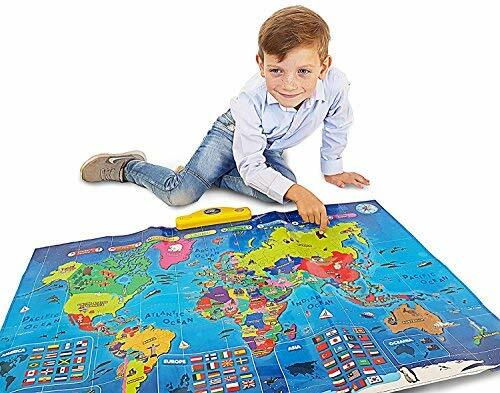 The TG661 Interactive World Map is recommended for children aged 6+ and is a 'ThinkGizmos' branded product. The super entertaining interactive map for kids can provide hours of entertainment. Warranty: All Think Gizmos products are covered by our 12 month manufacturers limited warranty (subject to fair use). Any problems please contact us directly. Proof of purchase required. The Smart Globe Discovery is the perfect fun, educational gift for your little one. Explore the world through 19 fun learning activities in the comfort of your home! Use the talking Smart Pen to interact with the globe and learn about fascinating topics ranging from continents, countries, capitals, population and currency. There's also a local map to explore more about your home country. Test your knowledge with the Ultimate Challenge and explore the world like never before. You'll discover a love of learning that will last a lifetime! TOUCH - Use the SmartGlobe pen to touch all over the globe. The stand base and world globe contain digital touch points almost everywhere! AUGMENTED REALITY - New for 2017! Use the Oregon Scientific SmartGlobe AR app to bring the globe to life with animals and dinosaurs! This is a perfect desk decoration for home and office, and this is an awesome high tech gadget that people of all ages will enjoy. It is operated by an electronically controlled magnetic system. The magnetic above the gadget contains an electro magnet and a magnetic field sensor. The base contains a micro-processor and the electronic control components that make the gadget levitate. The gadget is simple to install. Once you get the gadget levitating, just give it a little spin with your and watch it rotate for an extended period of time. Do not place it in close proximity to computer devices/ USB keys/Media Players /other types of electronic device. Automatically controlled by an internal computer. Constantly monitors the distance between the globe and the electromagnetic head Though hidden in the picture, all levitating globes have an electrical cord that comes out of the base and must be plugged into an electrical outlet for the levitation feature to work. Magnetic Floating Globe is suspended in mid-air by magnetic technology & Rotates 180 degree while hanging in the air. Floating Globes Levitating Globes there are 3 led beads in the Side of C so that it could beatiful when the light working. Globe is 3.3-inch in diameter, and stand 7 inches tall,It is easy to operate it.Normally this operation can be done within 30 seconds. NICE GIFT: Looks great on your work desk, side table,school room or Room.And also it will be a wonderful gift for friends, childrens, colleagues, even your boss.Perfect birthday gifts for men. Explore the world of geography with the Advantus Desktop World Globe with Blue Oceans. 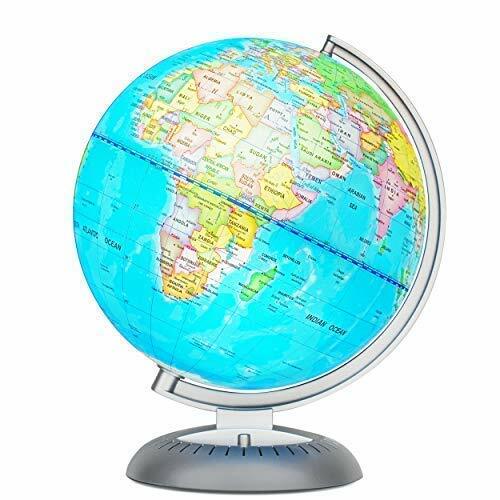 This 12-inch world globe includes thousands of locations and geographical features highlighted with bright contrasting colors. It is mounted on a silver full-meridian and base and features raised relief. 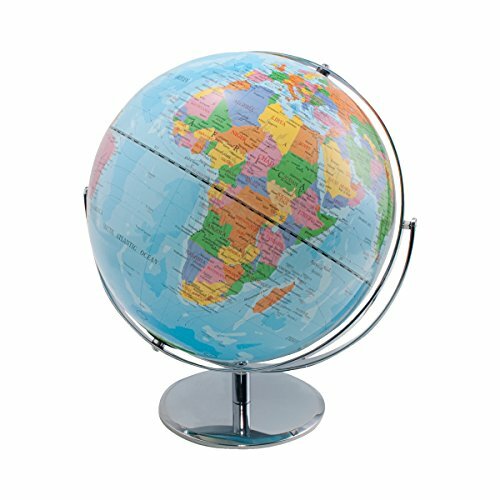 Globe measures 12 x 15 x 13 inches and is a perfect addition to any classroom. Scratch The Map! Track Your Adventure ! personalized continually changing us map. works exactly like a scratch card, once the scratch is removed it reveals the mapping underneath. more states as you explore more of the country. When you scratch, we suggest you to start on the border lines first and work your way in. For better protection of the map, hang it with the frame(not included) or store it in the tube . Never forget all the amazing places you've been and all the iconic locations around the world with a colorful world scratch off map designed for avid travelers. Those who say that Earth is a "small world" have yet to traverse the 7 continents and 196 countries that dot the landscape. In fact, the world still offers so many amazing sights, sounds, foods, and adventures that it's still a challenge to see them all in one lifetime. That's why we want to help you remember all the amazing places you've been with a premium world scratch off map poster that details all your adventures with a high-quality, beautiful map surface that reveals every location you've visited and all the awesome things you've seen along the way! Click 'Add to Basket' now to get this premium world scratch off map to catalog all your travels and vacations with colorful style. SCRATCH OFF MAP OF THE WORLD WITH FRAME - This travel map poster features cities, states, flags, international countries, and colourful icons, all framed in a teak wood frame with 5 strong magnets that's stylish, paintable, and fits every home interior. EXTRA-LARGE MAP SIZE - At 33 x 23 these travellers maps include all the beautiful locations you've visited or dream about going to, including the USA, Canada, Mexico, China, Australia, the UK, and so many more. 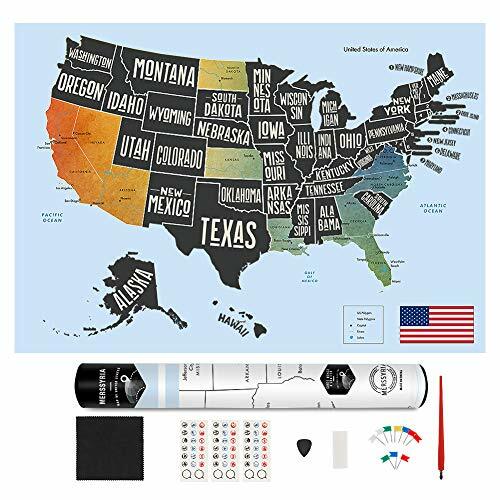 COMPACT, PORTABLE STORAGE TUBE - Our travel map wall decor also comes with a sturdy and reusable tube and a scratch tool to help you protect your map when it's being moved and to make scratching off and revealing locations easier. GIFT FOR ADVENTURERS - Ideal for kid's classrooms, avid travellers, parents, and friends with wanderlust, give these scratch map posters to anyone who travels to faraway lands or across the country to seek out adventurer and untamed lands. MONEY BACK GUARANTEE - Every map is crafted with accuracy and attention to detail and backed by high-quality resilience you can trust. In fact, every scratch off map we create comes with a 90-day money back guarantee for a trusted, risk-free purchase. Looking for a way to visualize your travel goals and dream vacations? MyNewLands is perfect for keeping track of where you have been and where you're yet to go. Just use the Scratch Tool, that is included, to scratch off the gold foil that covers the places you have visited. You will have a custom scratch off map of the world that you can frame or keep stored away like a scroll. This is the biggest gold Scratch Off Map available on Amazon. It measures 36x24 inches. When framed, it is easy for people to see where you have been. This makes it a perfect conversation starter for your home or office. Every U.S. state and Canadian province is individually labeled. Even large countries like Russia and China are separated into their smaller regions. This way, you won't need to buy a separate map just to keep track of your smaller adventures. Made from heavyweight lacquer paper that will not rip easily like low-quality Scratch Off World Maps. The material is durable and will last for years. The paper has a beautiful glossy finish covering the vivid colors. When revealed, each country and state has a bright color that pops in contrast with the background. Each scratchable map poster is packaged in a black poster tube. Inside you will find a greeting card, felt, pins, and the scratch tool. Whether you are buying this for yourself, as a gift, or as a way to teach your kids geography, MyNewLands is the best choice. In fact, it is recommended by Amazon for fast shipping, a great price, and a high rating. With a 100% money back guarantee, you have nothing to lose. Place your order today while supplies last.  BEST GIFT FOR TRAVELERS: Thick, quality material that won't tear easily like cheaper knockoffs. This premium quality Scratch Off World Map is Made in Europe. 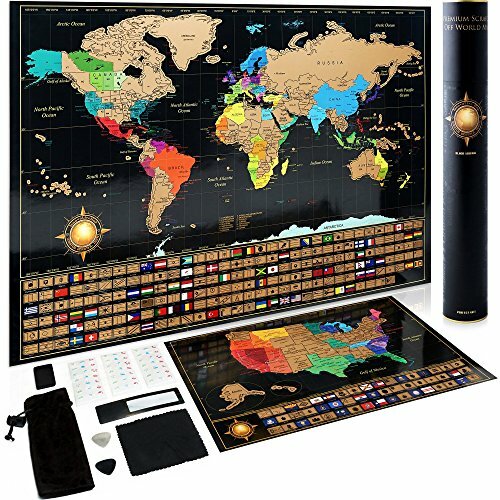 Every scratch off map of the world is packed into a stylishly designed tube, which protects your travel map from damage and solves the problem how to pack your present! This Scratch off travel map makes a wonderful special occasion gift for every traveller: friends, family, girlfriend/boyfriend, anniversary gift!  U.S. STATES AND REGIONS OF ALL LARGEST COUNTRIES OUTLINED! - The world travel map is designed with attention to details and features 11 major countries outlined and divided into regions and states. Even countries like Canada, China, Russia and other big countries are separated into smaller regions. 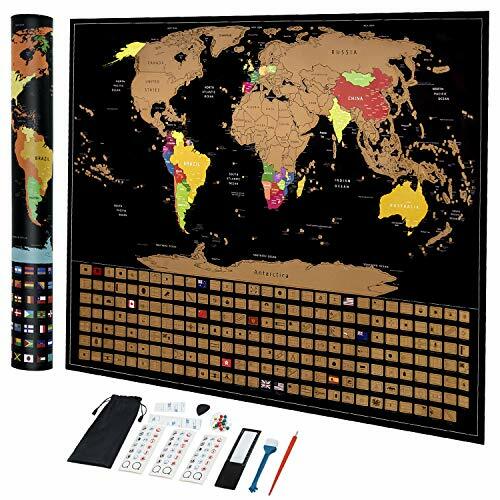 朗 CLASSY DESIGN & WITH ALL COUNTRY FLAGS AND VIBRANT COLORS: Our travel scratch off world map measures 36(w) x 24(h) inches. When framed, it is easy for people to see where you have been. When world map revealed, each country and state has a bright color that pops in contrast with the background. This makes it a perfect conversation starter for your home or office. A GREAT REMINDER: Celebrate your global travels and dream of adventures to come with the world map poster by MyNewLands. Exquisite cartography stands out with a golden finish and modern-inspired artwork. Easily scratch off the gold foil finish with the included scratch tool to keep track of destinations and new discoveries.  YOU WILL LOVE YOUR SCRATCH OFF MAP OR YOUR MONEY BACK: Hello! We are MyNewLands Company, nice to meet you on our page! Welcome to our travel world! You are making very intelligent decision doing business with our company. We know you're a big deal, and we'll only provide you with the finest product and service, or your Money Back with Lifetime Guarantee! Still have questions? Hit us up, we check every message! Beautiful scratch-off world map with accessories, including pins and pens. Blue ocean, silver coating, colorful continent after scratch-off. Good gift for friends and family. 35 * 25 Inches. NEW WAY TO RECORD TRAVEL --- Beautiful scratch-off world map. Blue ocean, silver coat, colorful continent after scratch-off. Good gift for friends and family. LARGE MAP & DETAILED CARTOGRAPHY --- 35 * 25 Travel Scratch off Map. With this map you can scratch off big cities, mounts, deserts which are on and under the scratch! HIGHEST QUALITY --- This top-ranked Scratch of world map is printed on a high quality thick laminated paper that won't tear easily, and covered with soft scratch foil which can be removed with the coin that comes with the map. So your Scratch World Map will last you for years! ALL ACCESSORIES - A full bag of pins and flags along with scratcher, magic pen and eraser. Mark at every where you go! CREASE-FREE DELIVERY --- Your travel scratch off world map is rolled in a tube for delivery, so it arrives ready to display! Do you love travel and want to have something that will remind you of the places you have ever been to? This Scratch Off Map of The World is just perfect for you. People love scratch off maps because they love travelling, and so do we. So we designed this Scratch Off Map of the world to help you record and share your travel stories with your loved ones, to relive your travel memories and feel the wonder of exploration! Add To Cart Now! To make your travel experience worth remembering ! letting the receiver record their travels in a fun way and share their stories! Savor your memories together with this gorgeous travel keepsake! BEEN THERE ? SCRATCH IT ! Whenever you have visited a country, scratch off the golden foil layer and reveal a whole new exciting and colorful world below- your own unique travel record! TAKE ACTION, EXPLORE THE WORLD NOW! Get ready for your next adventure with your new Scratch Off Map and explore the world together & scratch each country off one step at a time! What's inside the deluxe tube? Magnifying Strip-see it closer, remember it better! Track Your Trips: Do you love travel? We're travelers and we want to inspire your love of travel to the world! 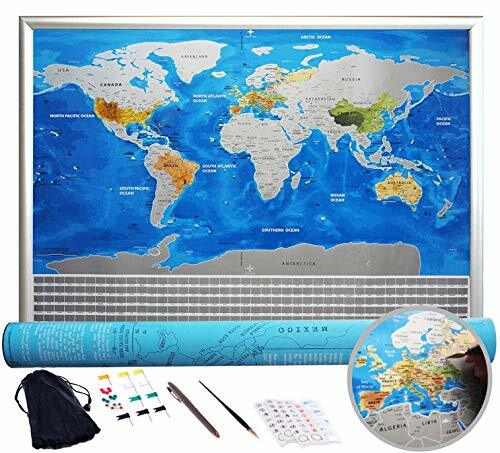 If you are travelers like us, it's really meaningful to track your travels with our 17 x 24"Scratchable World Map! Remember the places you have been to and plan your next destination, share your travel story with your friends. Unique Gift For Travelers: Need a special gift for a traveler friends? Our map comes packaged in a beautiful tube perfect for gifting and solves the problem how to pack your present! Whether you are buying this for yourself, as a gift, or as a way to teach your kids geography, our world map is the best choice. Perfect Size For Framing: The traveling maps come in standard formats 17x24 inches, easy to find a suitable frame. You can use it to elegantly decorate your home or office.Choose your favorite frame and have fun with this interactive work of art, it will take your room decoration to a whole new level, filling you with pride for your unforgettable travels. Durable Quality And Vibrant Colors: We use the highest quality 250GSM glossy laminated paper that won't tear easily, sturdy packaging tube ensures your scratch map arrives in perfect condition and is made to last and be enjoyed for years to come! The world is bright and colorful, so we made our maps the same way. Lifetime Money Back Guarantee: 100% Satisfaction or Money-Back Guarantee. All our products are tested, we will only provide you with the finest product and service. 24 hours online customer service,your 100% satisfaction is our top priority. This exclusive Palomar Small Yellow Personal Globe is perfect to decorate your favorite office while recording your traveling adventures. Printed using non-toxic inks on Cordenons Wild paper with 35% cotton, Palomar's Here By Cities Personal Globe includes 50 markers, and it is available in three different sizes at our Stationary section. 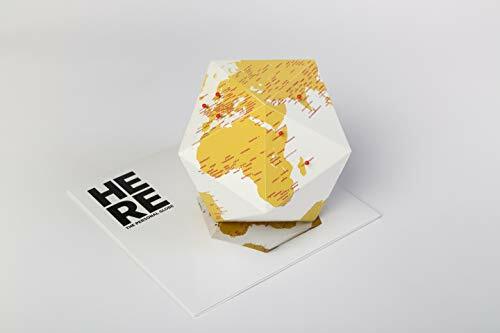 The designer of the Here Personal Globe, Francesco Toselli, states that "the analysis of the intersection between atlases and globes has generated a new project which is presented as a flat surface but turns into a three-dimensional and 'pinnable' world. Here is a globe that lets you trace a personal travel experience and invites you to mark the places: "I was here..." At first, the Here personal globe appears bi-dimensional, as an atlas; in just a few seconds it turns into a three-dimensional globe. The graphics enhance the paper's preciousness, tactile quality, and texture. Here stands up on its own, it is very light and can be placed anywhere, on a table or bookcase but also on the floor. Here is the world as it should be: as delicate as a poem, both simple and sophisticated, transparent to the point where we can always read our traces on it. This World Map is minimally designed for kids & young students and features the world in lively pastel. It utilizes concise and current geographical information. It measures 26" x 17 ", uses strong double-sided lamination for protection and durability, and it is shipped rolled in a tube. The design, print, and lamination are all done in the United States. WORLD MAP: This map features the political world in clear and lively pastel colors and presents the most current geographical and cartographical data available. MAP FOR KIDS: This map is designed in a minimalist manner to offer kids and young students basic and clear display of the countries of the world. DURABLE LAMINATION: Most map sellers habitually and inaccurately reference lamination when in fact they use only paper that is UV-coated. 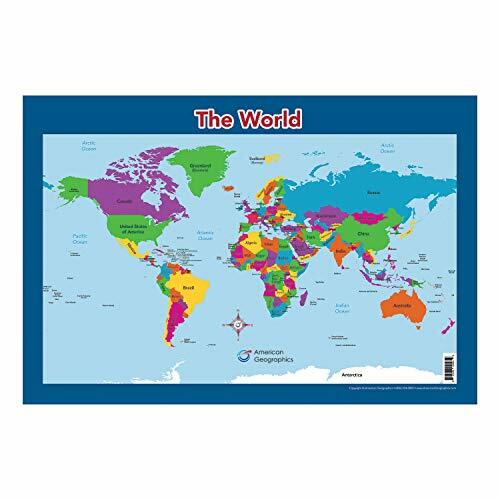 This map has thick, double-sided real lamination, providing protection and durability. SIZE AND SHIPPING: The exact measurements of the laminated map are 26 x 17 . The map is rolled up into a plastic sleeve and shipped in a tube. MADE IN USA: The designs, printing, and lamination are all done in the United States by American Geographics. Both maps are designed for kids and young students with clear and lively pastel colors and utilize concise and current geographical information. The world map features the political world and the US map shows the 50 states and their capitals. Each map measures 26" X 17 " and both are shipped rolled in a tube. Made in the USA. UNITED STATES MAP: using the same accurate and current data sources, this map features the continental United States (USA) with clear inserts for Hawaii and Alaska all in clear and lively pastel colors showing the state names and their capitals. 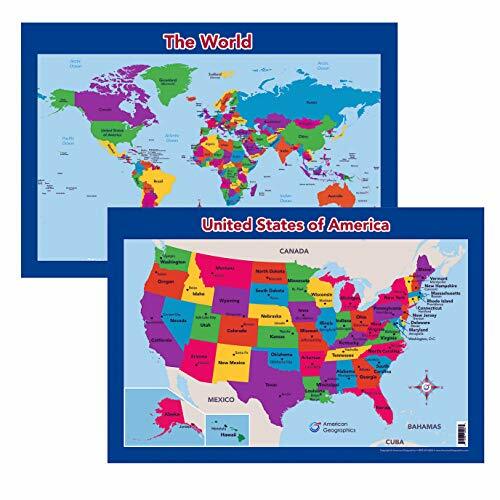 MAPS FOR KIDS: These maps are designed in a minimalist manner to offer kids and young students basic and clear display the countries of the world in the World map the continental United States (USA) with clear inserts for Hawaii and Alaska in the USA map. Our most popular United States wall map. Features all 50 States with insets for Alaska and Hawaii. All major cities, transportation routes, State boundaries, National Parks, inland waterways, and mountain ranges are clearly displayed and labeled. Available in several size, printing, and lamination configurations. Map is printed on premium quality paper stock, rolled, and packaged in a clear, hard plastic tube. Map Scale = 1:4,561,000 Sheet Size = 43.5" x 30.5"